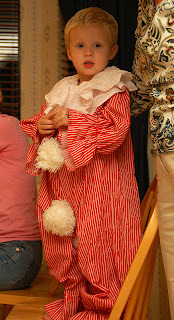 Grandma got him dressed up in Ryan's old clown costume from his toddler days as we finished up carving the pumpkin the night before. 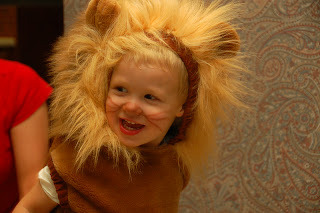 The little lion feeling coy with his costume on! 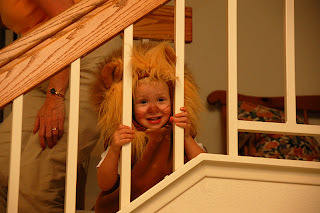 Coming down the stairs, pausing to giggle through the stair railings at daddy and mommy! 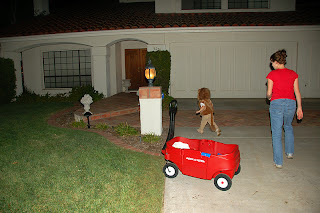 Heading out for some candy. He only had the energy for about 10 houses, but did pretty well. 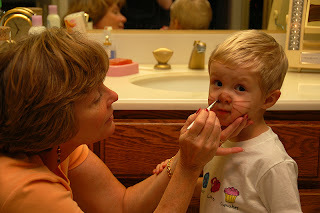 And please note that this little man said his trick-or-treat line as "keepa feet" this year. But he sure had his little roar and thank you's down, making his mama proud!